The developer confirmed that the next Halo will run on Xbox 360. Rumors persist that Microsoft is gearing up to reveal a new console soon. Some people "in the know" are whispering that we'll see something in January at the annual Consumer Electronics Show in Las Vegas, although why Microsoft would choose that show over E3 is anybody's guess. 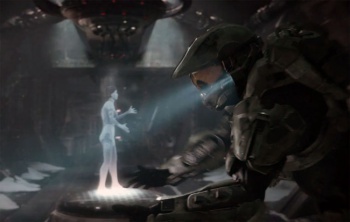 Such rumor-mongers even cited the fact that the house developing the next Halo omitted which engine the game would use to demo the game as evidence that it would run on the new console. Thankfully, the franchise director at 343 Industries Frank O'Connor sounded off on the NeoGAF forums, clearly stating that Halo 4 is an Xbox 360 game. "Halo 4 will be on Xbox 360 and use a modified core of the Halo engine(s)," he posted this weekend. O'Connor said that they are working on the game code all the time, so that's why there was no disclosure on which engine would used. "[It's] not really a singular engine since it goes through fairly radical evolutions all the time," he continued. Of course, O'Connor's statement doesn't confirm that no Xbox 720 will be announced in January, or that the new Halo won't run on that in addition to the Xbox 360. So, forum-goers, keep the rumor mill gristing!